Visual Studio Code>Programming Languages>Qt for PythonNew to Visual Studio Code? Get it now. 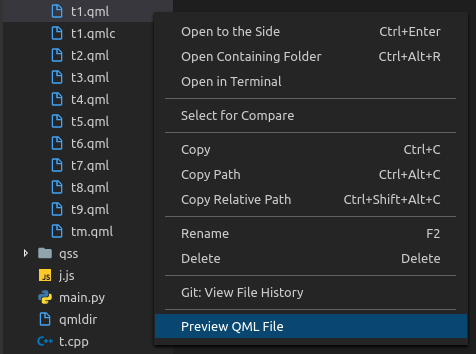 Qt for Python (PyQt5 and PySide2) extension for Visual Studio Code. 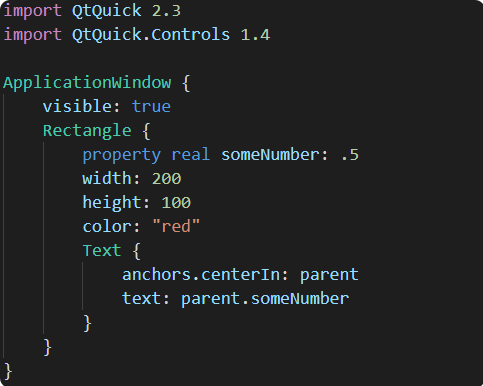 A Visual Studio Code extension provides some common functionalities for PyQt5 and PySide2 with Qt Creator. This extension requires Qt Designer, Qt Linguist, Qt lrelease and Qt qmlscene for different features. You could install these tools by installing Qt Creator. After the installation, you could find the tools within the installing folder of Qt Creator in your computer. For example, if you install Qt Creator 5.12.0 in /opt/Qt in Linux, you could find out the binary of these tools in /opt/Qt/5.12.0/gcc_64/bin. 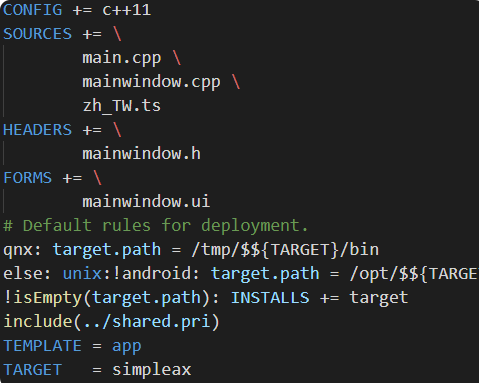 Or, for Windows, you could find the binary of the tools in C:\Qt\5.12.0\mingw73_64\bin if you did not change the default path. 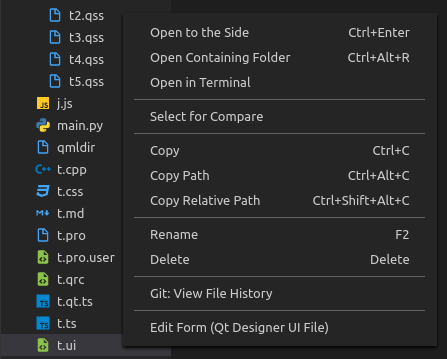 You have to set the paths of tools in Qt for Python section in user settings of Visual Studio Code before using the commands provided by this extension. Note: All file generated by the following command would overwrite the existing files with the same name without warning. When: Any condition for command palette or the target in explorer context is a folder. Behavior: Create new UI file in Qt Designer. When: The file name extension of the target file in explorer context or the current document in the editor is *.ui. 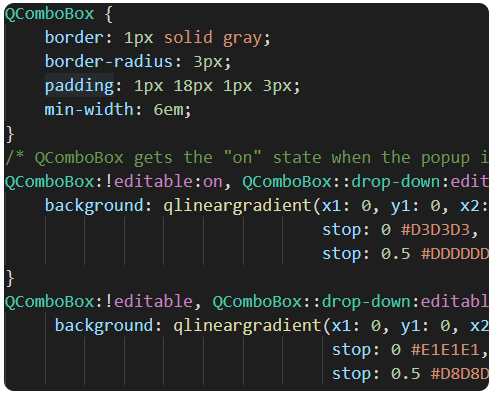 Behavior: Edit the UI file in Qt Designer. 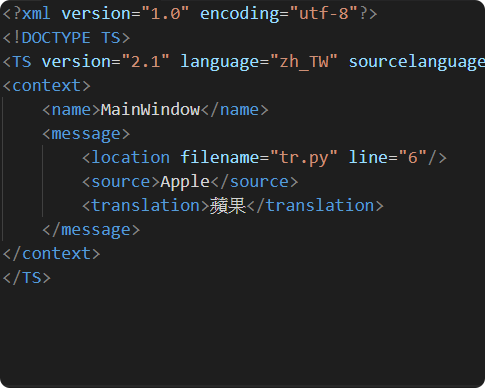 When: The file name extension of the target file in explorer context or the current document in the editor is *.qt.ts and the language is xml. 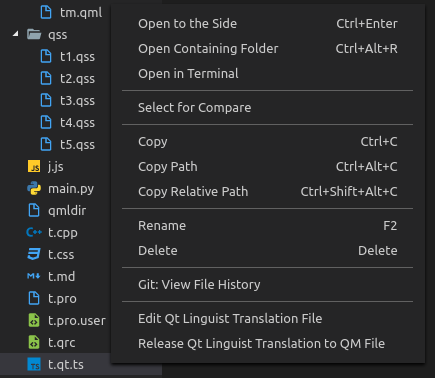 Behavior: Edit the qt.ts file in Qt Linguist. Behavior: Use lrelease to convert the qt.ts file into *.qm file. 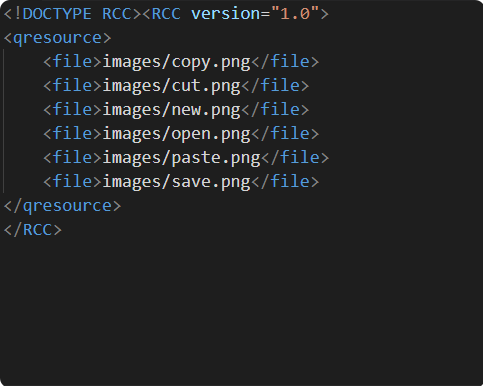 When: The file name extension of the target file in explorer context or the current document in the editor is *.qml. 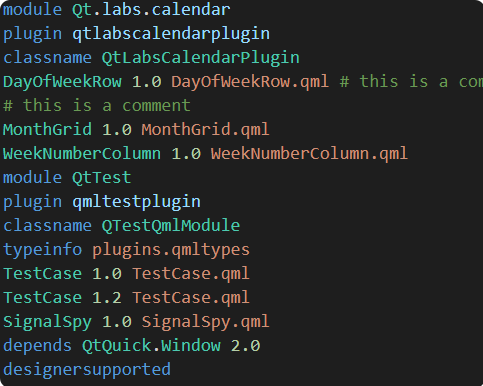 Behavior: Use qmlscene to preview the QML file. qtForPython.path.designer: The path of Qt Designer with CLI arguments to create and edit form (*.ui) files. For example, /opt/Qt/5.12.0/gcc_64/bin/designer. qtForPython.path.linguist: The path of Qt Linguist with CLI arguments to edit translation (*.qt.ts) files. For example, /opt/Qt/5.12.0/gcc_64/bin/linguist. qtForPython.path.lrelease: The path of Qt lrelease with CLI arguments to edit translation (*.qt.ts) files. For example, /opt/Qt/5.12.0/gcc_64/bin/lrelease -qm ./out.qm. qtForPython.path.qmlscene: The path of Qt QML Scene (qmlscene) with CLI arguments to preview QML (*.qml) files. For example, /opt/Qt/5.12.0/gcc_64/bin/qmlscene --verbose. Please see the release notes in CHANGELOG.